Having listened to the story of Iwasawa Masami's past, some would say she got the short end of the stick in life. But Iwasawa herself does not think so. She just needed a bit more freedom and a bit more time. But things do not always go according to plan. Iwasawa knows this, accepts this. Even as the situation around her rapidly changes, the world born within her heart is calm. Her fingers move and her guitar sings a song of sorrow and fortitude. 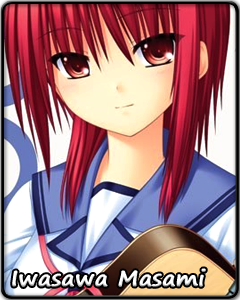 Iwasawa keeps on playing, hoping to save somebody just as she herself was saved.